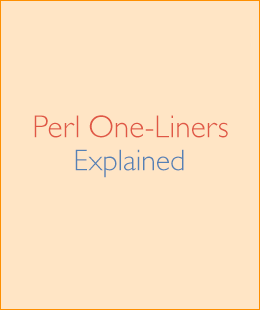 This is the fourth part of a nine-part article on Perl one-liners. In this part I will create various one-liners for string and array creation. See part one for introduction of the series. I decided that there will be two new parts in this series. 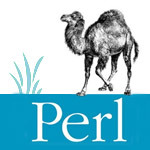 The most powerful feature in Perl is its regular expressions, therefore I will write a part on "Handy Perl regular expressions." I also decided to publish an e-book after I am done with the series, so that will be the last part of this series. Subscribe to my blog to know when that happens! Here the list a..z gets joined by a comma before printing. 50. Generate and print all the strings from "a" to "zz". Here the range operator .. is used again. This time it does not stop at "z" as in the previous one-liner, but advances z by one-character producing "aa", then it keeps going, producing "ab", "ac", ..., until it hits "az". At this point it advances the string to "ba", continues with "bb", "bc", ..., until it reaches "zz". Here it goes like "aa", "ab", ..., "az", "ba", "bb", ..., "bz", "ca", ... "zz". Here the array code>@hex</code gets filled with values 0, 1, 2, 3, 4, 5, 6, 7, 8, 9 and letters a, b, c, d, e, f.
The hex function takes a hex string (beginning with or without "0x") and converts it to decimal. Here the map function executes ("a".."z")[rand 26] code 8 times (because it iterates over the dummy range 1..8). In each iteration the code chooses a random letter from the alphabet. When map is done iterating, it returns the generated list of characters and print function prints it out by concatenating all the characters together. Operator x is the repetition operator. This one-liner creates a string of 50 letters "a" and prints it. This one liner creates a list of twenty repetitions of (1, 2) (it looks like (1, 2, 1, 2, 1, 2, ...)). Here the code>@months</code gets filled with values from the string containing month names. As each month name is separated by a space, the split function splits them and puts them in code>@months</code. This way $months contains "Jan", $months contains "Feb", ..., and $months contains "Dec". The qw// operator takes a space separated string and creates an array with each word being an array element. Here the values in array code>@stuff</code get turned in a string $string that has them separated by a hyphen. Turning an array in a string was done by the join function that takes a separator and a list, and concatenates the items in the list in a single string, separated by the separator. This one-liner takes the string "hello world", splits it into a list of characters by split //, "hello world", then it maps the ord function onto each of the characters, which returns the numeric, native 8-bit encoding (like ASCII or EBCDIC) of the character. Finally all the numeric values get joined together by a comma and get printed out. Similar to one-liner #55 above, function chr gets mapped onto each value in the code>@ascii</code producing the characters. This one-liner generates an array of odd numbers from 1 to 99 (as 1, 3, 5, 7, 9, 11, ..., 99). It uses the grep function that evaluates the given code $_ % 2 == 1 for each element in the given list 1..100 and returns only the elements that had the code evaluate to true. In this case the code tests if the reminder of the number is 1. If it is, the number is odd and it has to be put in the code>@odd</code array. Expression $_ & 1 isolates the low-bit, and grep selects only the numbers with low-bit set (odd numbers). See my explanation of bit-hacks for full explanation and other related bit-hacks. This is almost the same as the previous one-liner, except the condition grep tests for is "is the number even (reminder dividing by 2 is zero)?" Here $#array returns the last index in array code>@array</code. Since it's a number one less than the number of elements, we add 1 to the result to find the total number of elements in the array. Have fun with these one-liners for now. The next part is going to be about text conversion and substitution. It's almost done and will publish it in a couple of days. Check back soon.